Porsche's 911 has always been an electrifying ride. Today's Nice Price or Crack Pipe cabriolet takes that to the extreme, trading its gas-passing flat six for 144 volts of captured lightning. I wonder if you'll find its price equally electrifying? Older cars from defunct companies are a particular challenge for owners - I should know, I have a death's door Jensen Healey in my stable. The fact that Saab hasn't built a real Saab in a Saab's age didn't however stop fully 80% of you from advocating jumping into yesterday's 1991 900 SPG for its asking, as it was a pretty sweet ride. Hopefully consumables will be available for some time to come, allowing its new owner the opportunity to enjoy the car. You know what's a common consumable in a modern automobile, orphan or not? That's right, it's the battery. Dang but it seems like we go through those like Charlie Sheen goes through hookers, at least based on the pile of core returns I see at my local AutoZone. Over the years Porsche's 911 has gone through, not just batteries, but battery placement. Porsche started out mounting a single unit behind the left headlight, until it was decided that the cars needed a more even distribution of weight. In 1969 they doubled up the batteries and stuck one on either side, again behind the headlights to try and create balance and feng shui-level symmetry. That folly lasted until '74 when the need to fit the 911 with an oil cooler forced the return to a single jolt box which was moved back to on the front-left. Everything was hunky-dory until the 993 came along, when the battery was moved to the bottom-center of the trunk. Today's 1986 911 Carrera Cabriolet has its battery in the front of the trunk. It also has more batteries in the back and sides of the trunk, and in the bottom where the spare would normally sit. Oh, and there are also some batteries in the extreme rear of the car, under the whale tail, where the 3.2 once reigned. All those batteries are needed because where the Porsche flat six once sat, there now lives an electric motor. That's right mo-fos, instant torque to go with your instant karma. The 911 has always been known for having handling properties that could be dangerous in unfamiliar hands. This one, owing the greater balance of weight shifted to the front may be less so, and it's both now silent and deadly! What are the particulars of the installation? Who the hell knows. What's apparent form the ad is that the sellers have very limited knowledge of the car, other than it may not be a salvage title. How's that for an assurance? The ad does note that the conversion was professionally undertaken, an assertion that seems plausible owing to the tidiness of the bits evident in the pics. The seller also claims that the 144-volt system comes from ZAP Electric Vehicles, makers of the XEBRA, ZAPINO, and ZAPPY electric cars and scooters. My only experience with one of ZAP's products was being overcome by construction adhesives fumes in one at the LA Car Show a few years back. Live and learn. 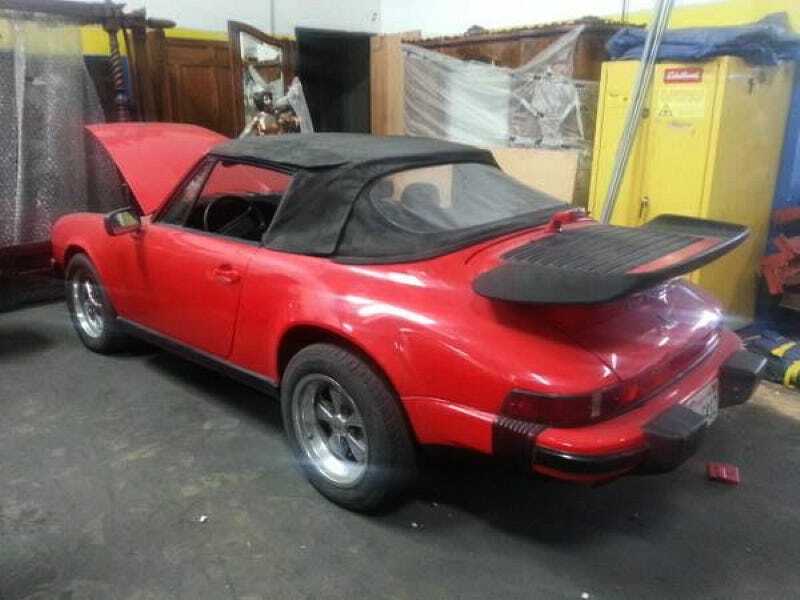 The rest of the car seems textbook 911, and the Fuchs under-pinned wide-body seems pretty straight and clean, although the seller's assertion that the top is in good shape as when erected it looks like it was raised by Boy Scout Troop Don't-Give-a-Damn. The interior is marred by carpet that looks heavily faded and a Donald Trump hairpiece-crazy dash cover. The ad notes that the car is drivable, but needs to be 'dialed in' for most fun, whatever that involves. No word on how much life is left in those batteries. There's a great deal of appeal in the use of an electric motor in an automotive application, and truth be told its instant torque and high power to weight ratio make them the perfect motivational force for a sports car. The only downside of such an application is the fact that electric motors use electricity, and storing that genie in a bottle is a challenge when it comes to weight, space, and capacity. Tesla has overcome a good portion of these issues with their sweet and blindingly quick Model S, but those damn things cost the better part of $100K, and you can't get one as a whale tailed drop top no matter how nice you ask. Here you get perhaps the best of both worlds, Porsche sexiness and electric quickness and efficiency. The specifics however seem to be a roll of the dice. As far as price, that roll come up $18,000, which would be cheap for a Carrera of this age that lets the sun shine in - and takes premium. Here, that value is tempered by the electric install which comes fully charged with questions. What's your take on this electric 911 for $18,000? Is that a price that would have you plugging in? Or, is that too much for Ohm's law and disorder? 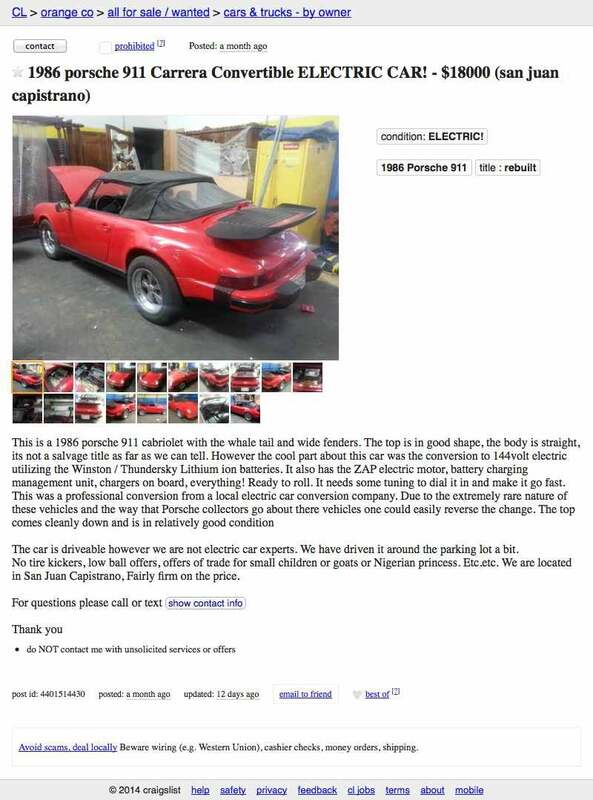 The OC Craigslist, or go here if the ad disappears. H/T to Scott Edmonds for the hookup!